This Irish garden gnome statue features a GLOW IN THE DARK Orb in his Shamrock. The Irish garden gnome figurine with a GLOW IN THE DARK Orb in his shamrock also features dimensional four Leaf clovers around his shirt. 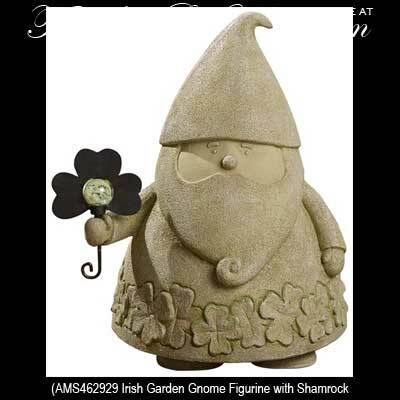 This Irish garden gnome is made of cement and resin and is suitable for outdoor use. The Irish garden statue measures 10 1/2" wide x 13" tall x 8 1/2' deep; weight is 9 pounds. Due to the weight and size, this Irish garden figurine ships separately and ONLY by ground freight. Typical delivery is 5 - 7 days. The Irish garden gnome ships separately and by ground freight only. Typical delivery is 5 - 7 days.